Have you heard of oil pulling? Overnight, oil pulling has quickly become the newest (old) health craze out there! I have had three different friends ask me about oil pulling in the last two weeks, so I figured it was time for a blog post about it! I say oil pulling is the “newest (old)” health craze as oil pulling, an ancient Ayurvedic tradition, has actually been around for centuries. Oil pulling involves swishing around oil in your mouth for twenty minutes at a time, to “pull” the toxins out of your mouth (and body). After twenty minutes you spit out the oil and go about your day! It should be done right upon waking up (prior to teeth brushing/eating) and right before going to bed. Oil pulling is based around the idea that the mouth is one of the major gateways to the body and that a healthy mouth equals a healthy body. Large amounts of bacteria, good and bad, are stored in the mouth. Further, there are many articles outlining the link to gum health with cardiovascular health, cancer, diabetes and even arthritis. There are not a lot of studies conducted on oil pulling, however one study conducted in 2008 found that after 48hours, 1 week and 2 weeks, the group that did oil pulling, with sesame oil, had a statistically significant lower level of Streptococcus mutans (the bacteria measured) in their plaque and saliva than those who swished with chlorhexidine mouthwash. A second study tested the gingivitis levels pre and post oil pulling. Again, there was a statistically significant reduction in the plaque and gingivitis scores, along with the count of aerobic microorganisms in the mouth. Lastly, there are hundreds, if not thousands, of personal testimonials online of the results attributed to oil pulling. 2. Take a tablespoon and swish around in your mouth for 20 minutes. Note that with coconut oil, it is usually solid, but it will melt in a few seconds once it’s in your mouth. 3. Find something distracting to do for 20 minutes. Time will surprisingly fly! 4. After twenty minutes, spit it out, then brush, floss and go about your day! Note: for best results, oil pulling should be done twice a day (upon waking, and before bed). I believe there are definitely benefits to oil pulling. Last year, I did it for four weeks, and noticed that my teeth were whiter, my breath better, and my gums bled less. I initially tried it as I had receding gums in 2 spots from having braces growing up. I had heard that oil pulling could potentially reverse the receding gums. It didn’t do this for me, however I only did it for 4 weeks, so that may not have been enough time. Lastly, and this is likely the graphic/gross part, so apologies in advance…If you’ve ever done oil pulling, you know that after twenty minutes, that oil tastes pretty gross. That is enough to make me think that given the taste, it’s likely pulling a LOT of toxins out of my mouth, and therefore body! So there you have it. Everything you need to know about oil pulling! 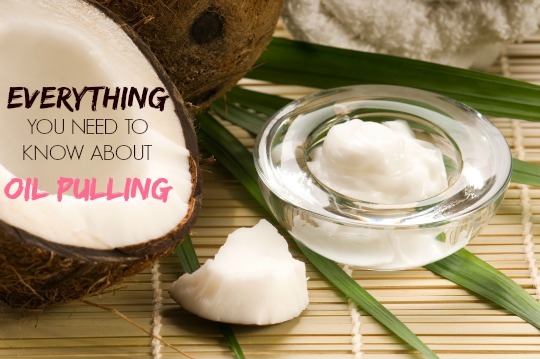 Leave a comment below with your experiences with oil pulling!